This morning as I sat eating breakfast next to a wonderful Crepe Myrtle tree in full flower and buzzing with bees, I realized that a person could find it hard to believe that bees might be an endangered species. 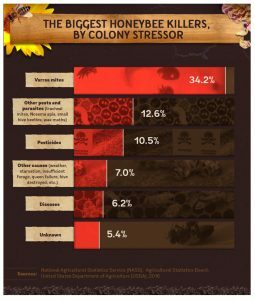 After all, I reported here myself last March about how Colony Collapse Disorder in honey bees seems to have subsided. But, while the largely domesticated honey bees growers use to pollinate almond groves are faring much better, there are actually 30,000 species of bee, and the wild ones have dramatically declined in China, Brazil, North America, and Europe. And that’s a problem! 70% of the crops we rely on depend on pollination to produce the food we need to survive. Domesticated honey bees—the ones in commercial hives that you see shipped into the almond groves and other farm locations every year—do not do ALL the pollination (or even most of it in many cases)! They actually supplement the work of the native bees and other pollinators like hummingbirds and other insects. In fact, there are actually specific species of wild bees that have co-evolved with certain crops that do a much better job of pollinating those crops than domesticated honey bees do. For example, honey bees are not physically large enough to do a good job pollinating tomatoes but our large North American bumble bees are fantastic at it! Unfortunately, we’ve seen tremendous losses in native bee populations in recent years. Last year a North American bumble bee species was put on the endangered species list after having suffered an 87% decline in the species population since the late 1990s, while seven native bees in Hawaii were put on the list previously. A combination of factors have combined to create this situation: varroa mites and other parasites, pesticides, changes in weather patterns and extreme weather conditions due most likely to climate change, decline of forage sources for nutrition caused by habitat alteration and fragmentation, diseases and unknown causes. Interstate transportation of domesticated honey bee hives has also played a factor as bees imported from other areas may have introduced the same parasites and fungal infections they contend with to native bee populations. Of course, many of those imports were important to help the honey bee population decimated by Colony Collapse Disorder recover. . . so this is a complex situation! To be honest, nobody knows for sure what the single best approach is for dealing with this, but it is probably a mixture of improvements in domestic beekeeping practices (which has been happening and will continue) and domestic national policies aimed at keeping native bee populations safe and bolstering their survival. We DO know one thing: it’s important! From a personal perspective as an almond grower and almond product producer, we know that our crop is 100% dependent on a strong honey bee and native bee population. We use local bees that are not stressed by being shipped across the country. We work hard to create bee-attracting natural habitats alongside our orchards, leave natural grasses in place in much of the orchard for the same reason, and grow many of our almonds organically without pesticides and chemicals that might disrupt the delicate balance between our cultivated crops and the natural surroundings. We also strongly support bee research and conservation through the Xerces Society for Invertebrate Conservation and The Harry H. Laidlaw Jr. Honey Bee Research Facility on Bee Biology Road, University of California, Davis. Check out our Save Our Bees page on our website to learn more.